There's no hobby as relaxing, fulfilling, and useful as gardening. It will keep you active and outside during the summer. It's the cheapest way to eat, and as an extra bonus, no food tastes as good as what you grow yourself. A properly planned garden can also be a beautiful addition to your property. With many factors to consider when designing your garden, it can be difficult to know where to begin. Here are some tips to help you create the attractive vegetable garden that's right for you. The first step is to choose the best location for your garden. Most vegetable crops need plenty of sun, so an unobstructed view of the south is a must. Convenient access to water is also critical. 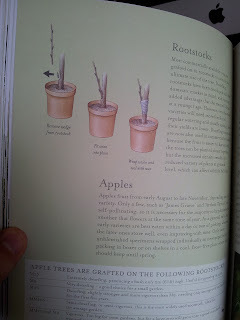 You also want to test your soil to see if it drains properly so the roots of your plants won't mould. You might need to consider designs that help improve drainage. There are many options for designing the layout of your garden. We'll take a look at the most practical first, and then move on to more aesthetically pleasing options. There's a reason why farmer's choose the standard row-cropping design, where crops are planted in single rows with about a half metre of space between. This allows for larger gardens that can be tilled and tended with machines. 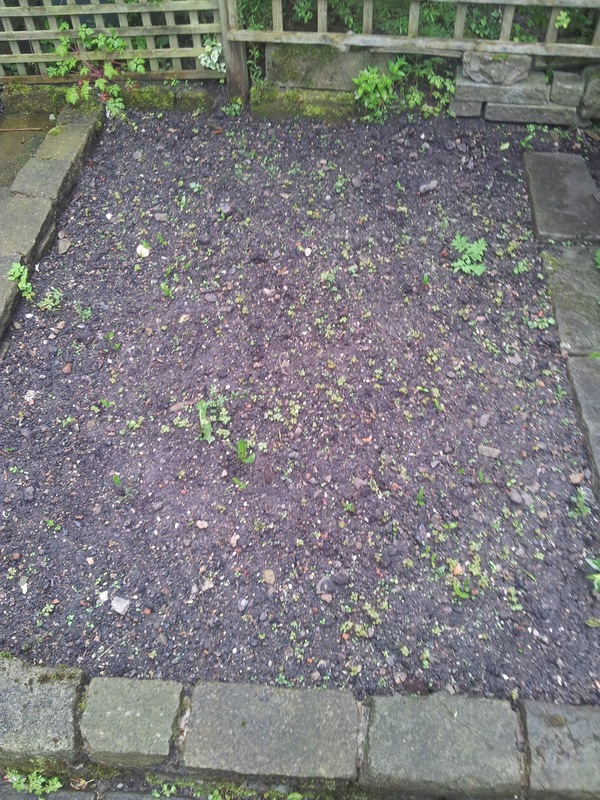 However, most people who grow personal gardens prefer to till, weed, and fertilise by hand. This makes it possible to have thicker rows or small plots. One popular option is the four-square design, where a plot is divided into 2-4 square metre beds that conserve space while allowing all plants and weeds to be within arm's reach. For a better-looking and more unique garden, try plots of varying sizes and shapes, intersected with parallel and diagonal lines. A personal favourite for both beauty and practicality is the raised-bed method. Here you build a 10-20 cm high wooden frame for each of your garden beds. 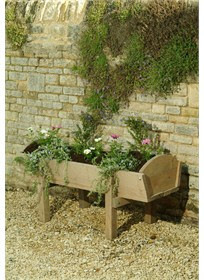 Like a picture frame brings structure to a painting, raised beds accentuate your garden. While building the initial frames is a lot of work, there are also several practical pay-offs, such as preventing soil compacting and improving drainage. The result is a garden that grows well and looks great. 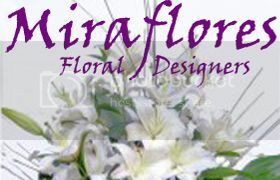 We are all used to seeing flowers and indoor plants in pots and other containers. 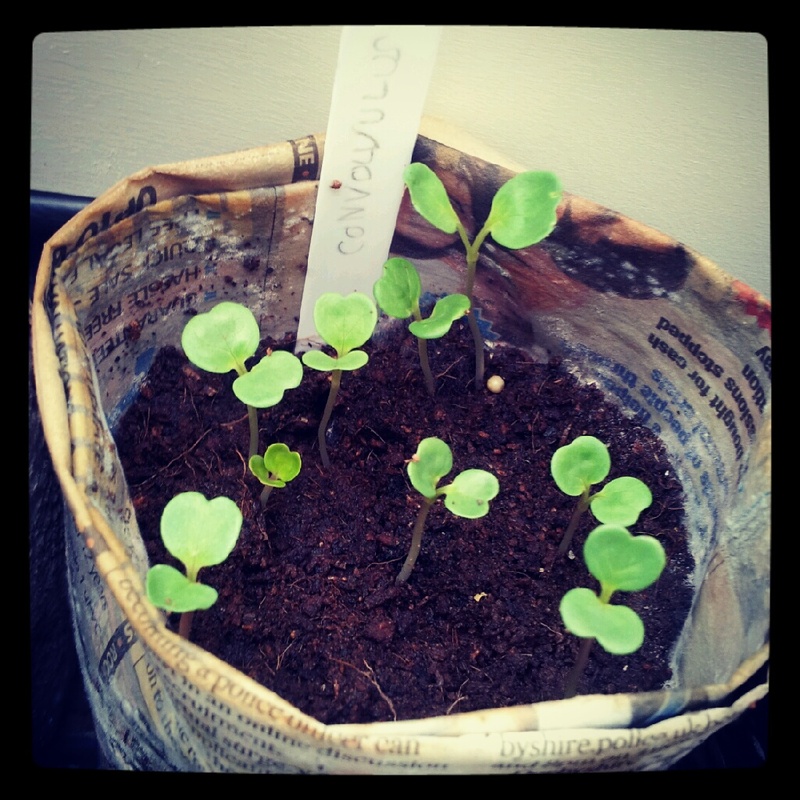 However, most vegetables also grow well in pots. These can interspersed anywhere in your garden, along your home, or conveniently next to the grill. Not only can you choose beautiful and creative containers, but you gain portability in case some plants start to look like they need more sun. Whichever design you choose, remember to be creative. Adding personal finishing touches can really make your garden special. An elegant birdbath will bring welcome, bug-eating visitors as well as adding charm. An arched entry is stylish and gives you climbing plants like peas something to hold onto. The result will be a space that is pleasing to your eyes and your stomach. View some of the innovative examples of work from Bluefishlandscapes garden designers, and their recent T.V collaboration with the loveyourgarden team, and the inspirational Alan Titchmarsh, the principal guiding hand, presiding over the talented group of landscapers. A truly beautiful garden takes advantage of the wonderful colour combinations nature has to offer. Growing flowers alongside your vegetables isn't just attractive, it also attracts beneficial insects that will pollinate your crops and kill harmful insects. Of course, there are also colourful vegetables that can add flare, like multi-coloured tomatoes, Swiss chard, and rhubarb. When I started a vegetable garden on my London balcony, planters and containers were an absolute godsend – on a concrete balcony, one simply HAS to have a good selection of planters and containers. Now that I have made the transition from London balcony to Peak District garden however, this does not mean that I no longer have any need for containers – far from it! Planning a garden is an enjoyable experience. And containers really add a degree of flexibility, style and ease of use. 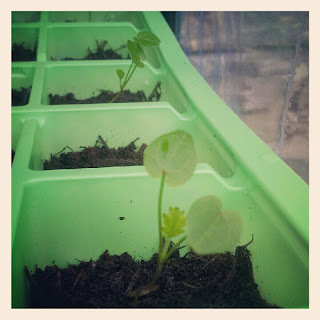 Here’s a rundown of why I love using containers in the London Vegetable Garden. From month to month (and even week to week in the peak summer season), plants take on a life of their own. A few neatly arranged pots can quickly become an amalgamated mass of unruly plants, whilst those suddenly flowering can clash with their surrounding neighbours. Containers and planters allow the gardener to move plants around with no interference to roots, allowing you to rearrange your garden and keep it interesting all summer, and year, round. Say ‘container’ or ‘planter’, and many people instantly start thinking about cheap plastic containers obtained cheaply from garden centres or pound shops. But there exists a whole wealth of planters and containers that are stylish, beautifully made and really add an ambiance to the garden in their own right. Depending on style, a well-planted container can completely transform the look of the garden. Some of my favourite planters and containers can be found here. As shown from the pictures below, planters and containers come in all styles, shapes and sizes and can fit into any garden, adding class, style and make excellent features. 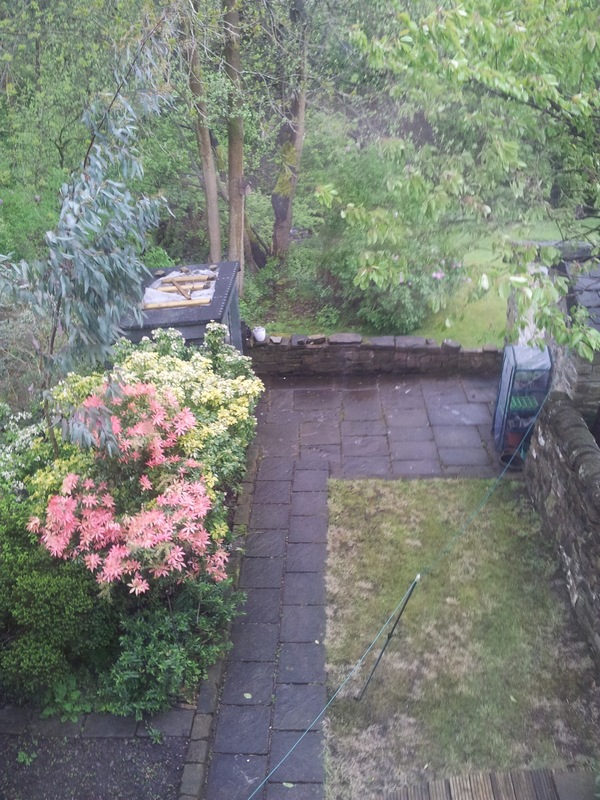 Like much of the UK, my garden has spent most of this summer under a blanket of dark grey cloud and rain. 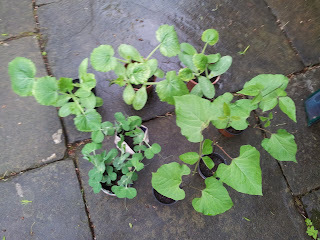 But the plants I have in containers have been salvaged due to their portability. 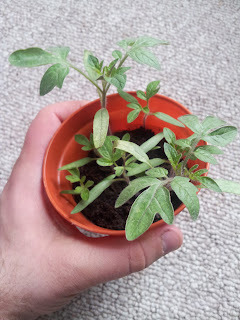 As overhanging trees and bushes have grown, blocking out natural light, I have been able to move those plants in containers to new, sunny positions, rescuing tired tomatoes and miffed marigolds. Containers allow you to shift plants around according to the season, keeping plants in the best possible position for them to flourish. In summary, planters and containers are a wonderful asset to the gardener, whether in a sprawling country garden, or on a small urban balcony. Combined with the right plants or flowers, a planter’s visual aesthetic can produce a stunning effect, adding colour, style and architectural lines to any garden. Have any of you experimented with planters or containers? If so, we’d love to see your examples. Feel free to upload your photos on our Facebook page. For a great selection of timeless, classic planters and containers for your garden, I recommend the product range available at Garden Trading. 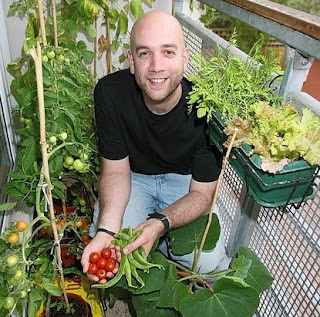 Growing your own is one of the most fashionable and rewarding activities that has swarmed the UK and it doesn’t matter if you have a large garden or just a balcony. There is a lot that you can cultivate in a few containers and below you will find advice on what pots you can grow in and the compost that is required to ensure that you always harvest healthy yields. Growing your own fruit and vegetables that are packed with vitamins and minerals will not only be well received by your body, but also that of your family. Having a supply of vegetables in containers allows you to eat fresh and enjoy a variety of flavours. So what containers will I need? It all depends on the yields you wish to cultivate. 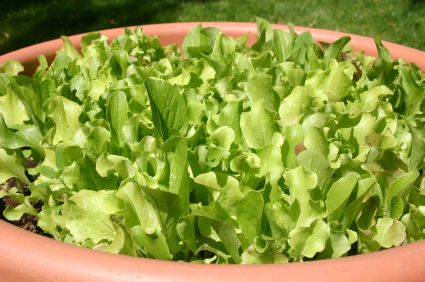 If salad leaves are at the top of your priority list, these plants can be grown in quite shallow containers. A 17cm deep and 30cm long container would suffice, but we would recommend that you have a trough that is measured 20cm wide, 60cm long and at least 17cm deep. The amount of containers that you would need also depends on the succession of crops you wish to obtain. For example, if you have two troughs you can grow two rows in one and then a couple of weeks later another two rows, ensuring that you’re never short of lettuce leaves over the course of the summer. Where do I place my containers? We recommend that you place your containers close to home as you will be more likely to use them and also for convenience. How often do I need to water them? A general rule of thumb is that the larger the container, the less often you will need to water. An even and uninterrupted water supply is one of the keys to growing you own veg. 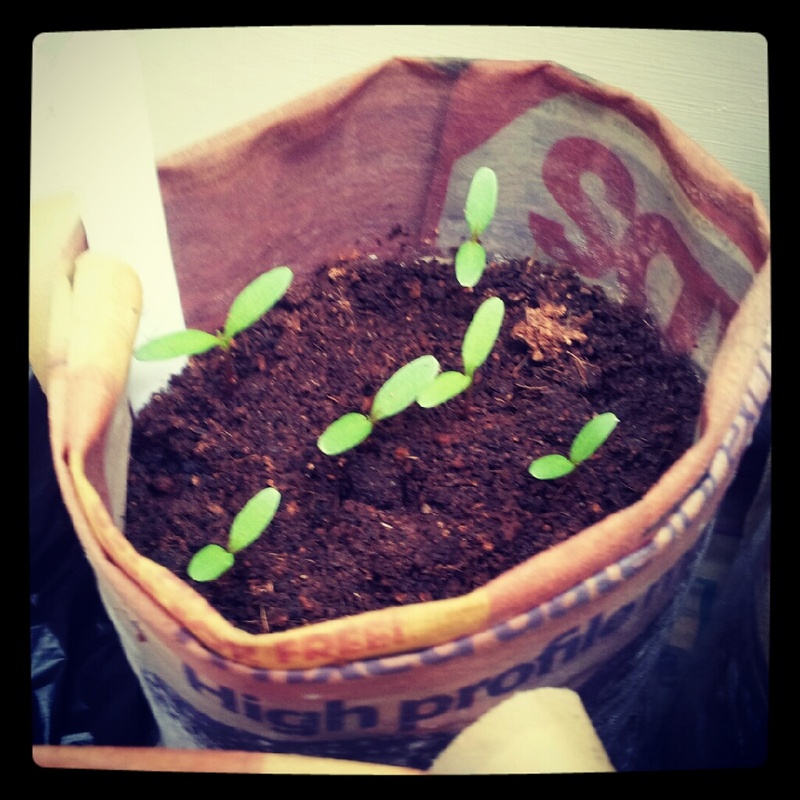 What compost should I use when growing veg in containers? The growing medium that you need to use can depend slightly on the size of your container, but if you’re not a perfectionist, this wouldn’t really matter. For smaller containers that will become the home for your lettuce and carrots for example, the cheapest compost you can find will suffice. 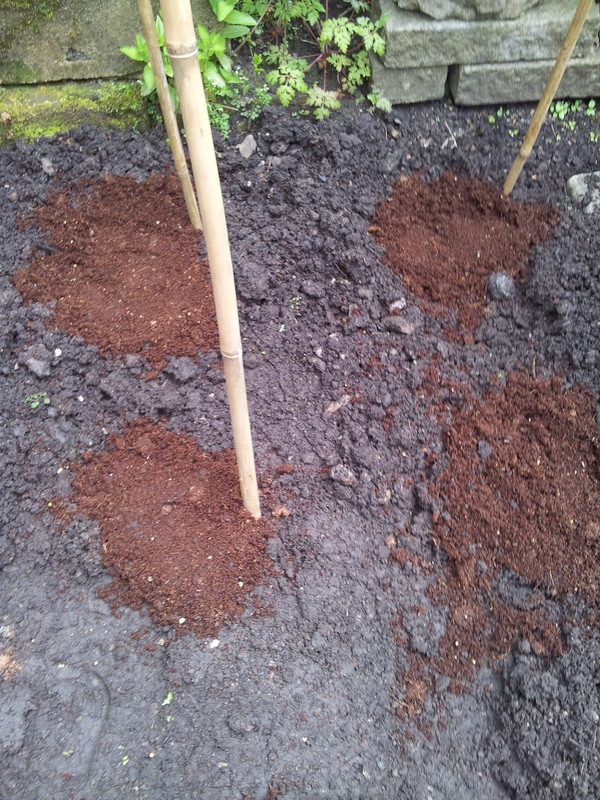 For large containers or raised beds, a good multi-purpose compost or a loam-based compost will work wonders. However, please do be aware that these containers can take a lot to fill so to keep your container garden cost effective it may be best to bulk buy or use top soil. Planning to become self sufficient is a big step and these are some of the first steps to take when growing vegetables successfully. 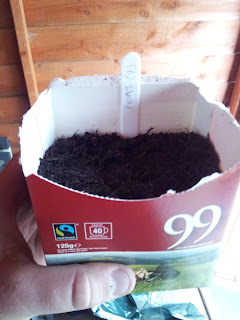 From this point on all you need to do is plant up and ensure you follow the instructions that are on the back of the seed packs. Mr McGregor is a popular writer for Notcutts, a specialist garden centre who also enjoy meeting and lending a helping hand to their customers. 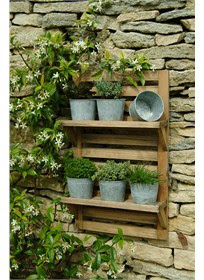 For more tips on how to get started with growing your own have a look at their Garden Library and blog. Growing vegetables affords the gardener a myriad range of beautiful sights, with plants consisting of a different shapes, sizes, textures, form and colour. However, combine these plants with flowers and you have a quintessential English garden. 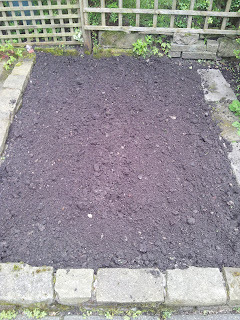 Along with vegetables, I'm also growing a range of flowers this year. 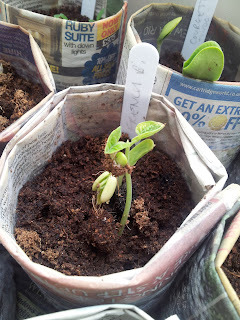 I enjoy the challenge of gardening from seed and the huge sense of achievement that it brings. The commitment and dedication to nurture plants and flowers from seeds is great; thus so is the reward. 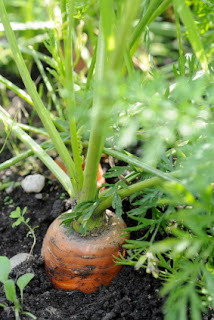 As well as the colour and beauty that flowers bring to the garden, they can also be fantastic for the vegetable grower! Companion planting is an age-old technique employed by gardeners as an organic alternative to chemical pest deterrents. I'm growing French marigolds because I like them, but also because they are the perfect companion plant for tomatoes, which I am also growing. Tomato plants are highly susceptible to whitefly, which can damage a whole crop. However, whitefly detest French marigolds and thus avoid them like the plague! Not only do the marigolds keep whitefly at bay; they also make the garden look very pretty! As always, progress will be documented here on the London Vegetable Garden blog, as well as over on Twitter and our Facebook page! For several years now, the grow your own movement has continued to gain substantial sway, with people seeking a return to wholesome, natural and sustainable food production, as well as a simpler way of life. There are many relevant gardening books available to the amateur gardener, but it can often be difficult to find the right book, whether you're looking for practical advice or are simply eager to find out more about techniques and the cultural history of gardening and food production. 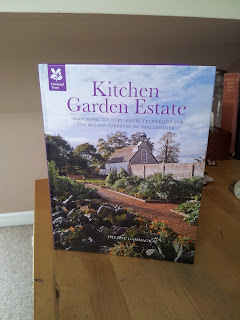 The National Trust has recently released a fantastic new book entitled 'Kitchen Garden Estate' by Helene Gammack, in which traditional country-house techniques for the modern gardener or smallholder are explored. And they kindly sent me a copy to have a look at. I'm a huge advocate of the National Trust and in typical fashion, this book is of an extremely high standard, exploring a range of gardening techniques employed by country estates prior to the industrial revolution, when of course large estates had to be self-sufficient and provide all of their own produce, from meat and game to fruit, vegetables, milk and much more besides. 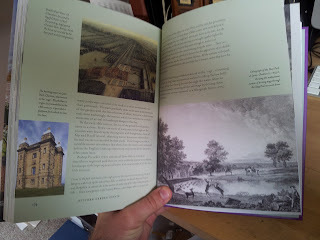 Whilst the average reader (myself included) is not likely to have an orchard, vineyard, lakes and dairy cattle, the techniques used in days of old are fascinating and absorbing to read about. 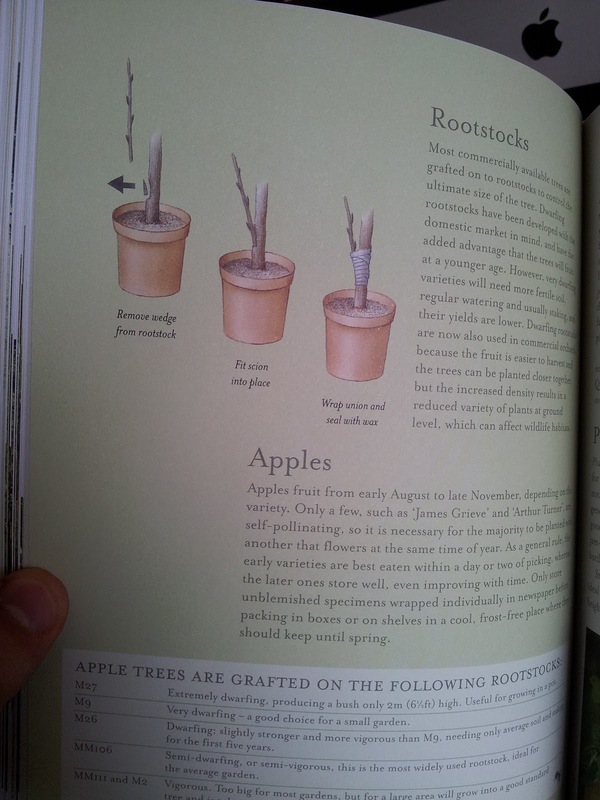 As one would expect from a National Trust book, the tome is littered with beautiful pictures, historical illustrations and diagrams, ensuring that time-honoured gardening techniques are clearly explained and made relevant to the modern-day gardener. 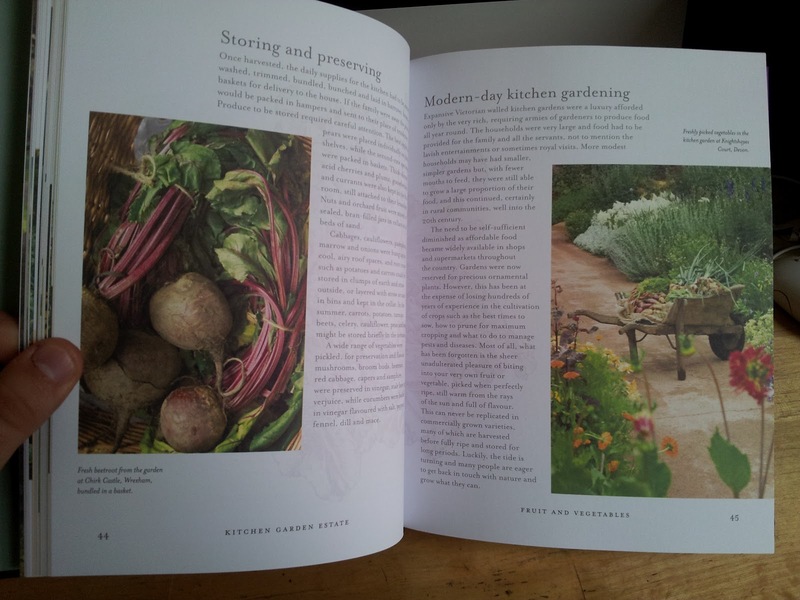 The first few chapters really explore the history of fruit and vegetables, sharing advice, recipes and tips that have been passed down over hundreds of years and these first few chapters really do offer practical advice, from companion planting guides to salad garden layouts. 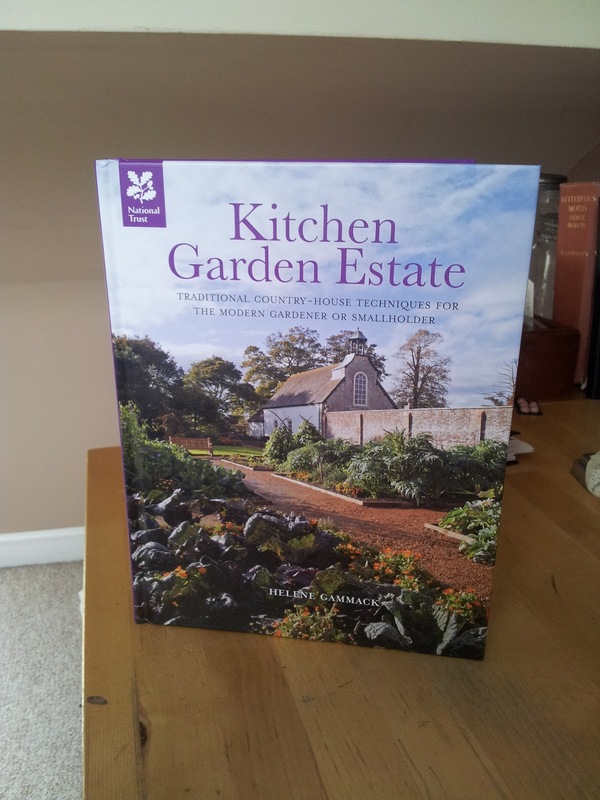 In summary, Kitchen Garden Estate is a wonderful and absorbing book, combining the perfect mix of practical advice, historical intrigue and beautiful pictures. The book is available to purchase directly from the National Trust website for a very acceptable price of £15 and makes a wonderful addition to your garden book collection, or a perfect present. Space: the final frontier! 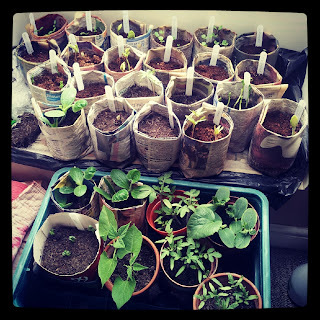 For many urban gardeners, especially those living in flats with balconies, the lack of soil and space means that gardening attempts are limited to crops in pots and containers. But this is not limiting at all. Many vegetable plants don't require a large mass of space: some simply like a deep pot; others are quite at home in grow-bags and others can simply be grown in, well, anything! Although I have a garden, actual soil space is very limited, so during this summer's London Vegetable Garden growing escapades, I'm planning to show you all what can be achieved in small spaces using bags, pots and various containers. 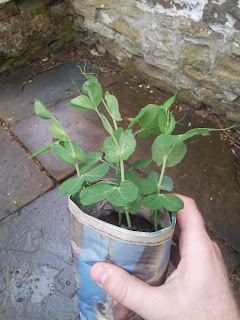 In the first of these 'space-saving' series, I'm looking at peas. There's nothing nicer than home-grown peas, plucked fresh from the pod and eaten raw, or boiled up with some mint and served alongside new potatoes and a lamb chop. 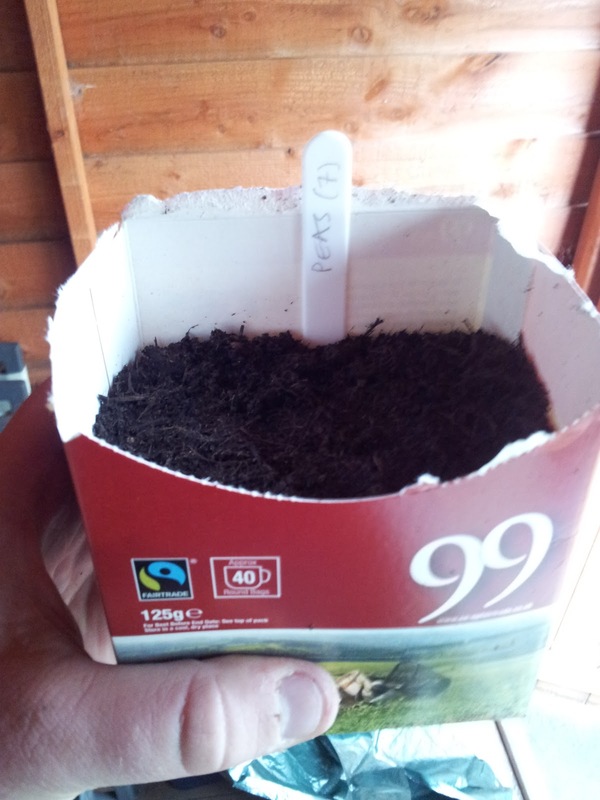 So this week, I'm showing you how you can grow peas on a balcony or on a small patio. Now, here's for the space-saving bit. 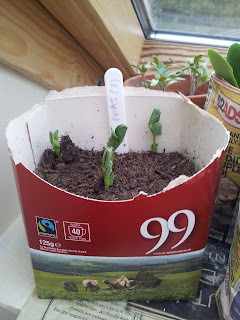 Peas like a little bit of depth for their roots, whilst the plants are climbers, meaning that they grow upwards. In terms of space, you'll only need a couple of square feet of space and about 5 feet of height to grow your peas – which on a balcony or patio, is more than achievable. Remember the newspaper pots? You can plant these straight into the soil, where the newspaper will disintegrate quickly, ensuring no root damage to the plants. 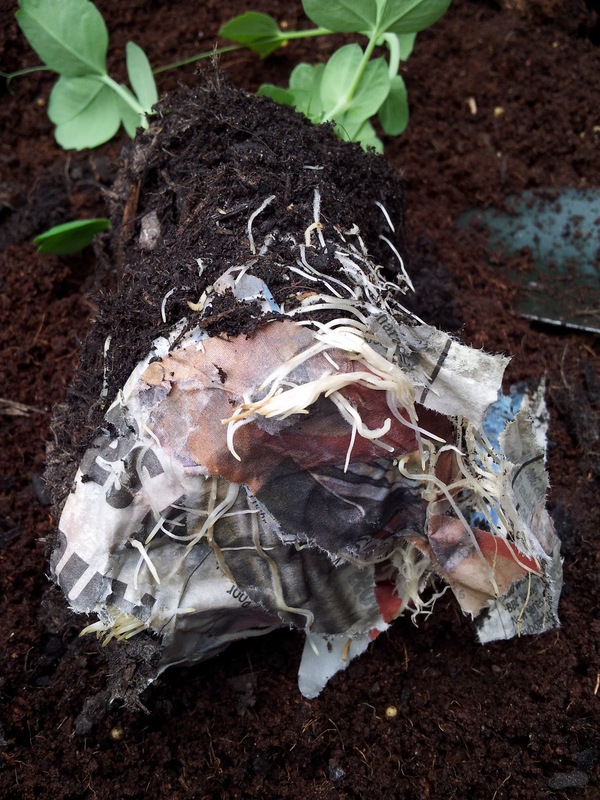 I've unwrapped one just to show you how strong the roots are – here they have grown right through the newspaper, so don't worry about planting the whole thing! 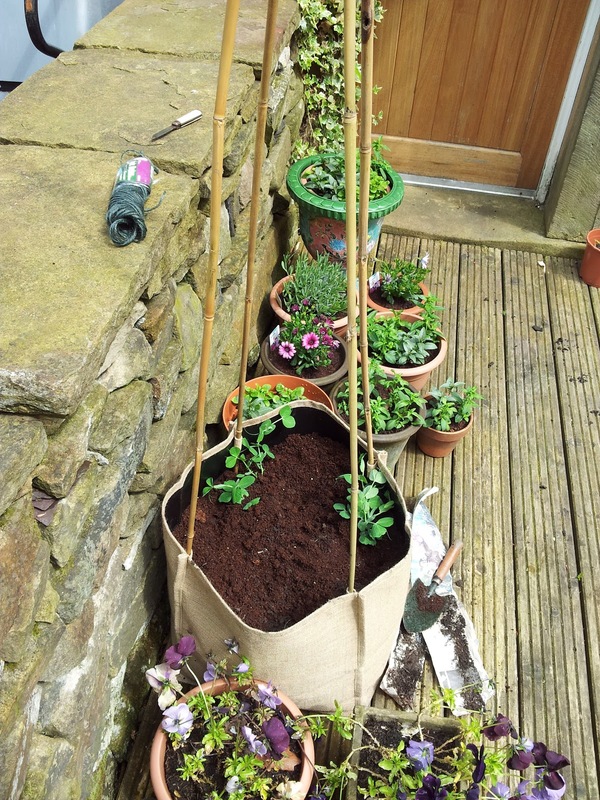 I'm planting my peas in a hessian sack, which was £6.99 from the local garden centre. 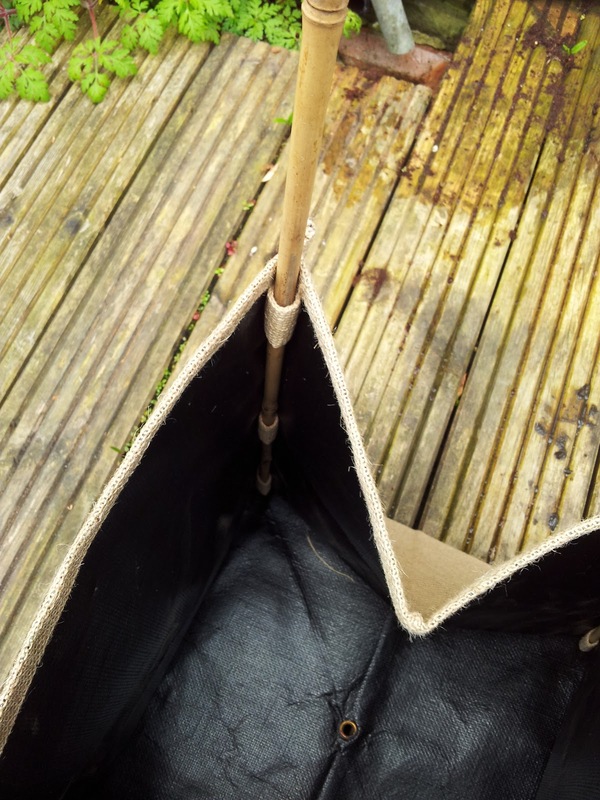 It comes with internal supports for the canes, which is a really useful feature, although you can use a deep flowerpot and tape cane supports to the side using duct tape – it will work just as well. 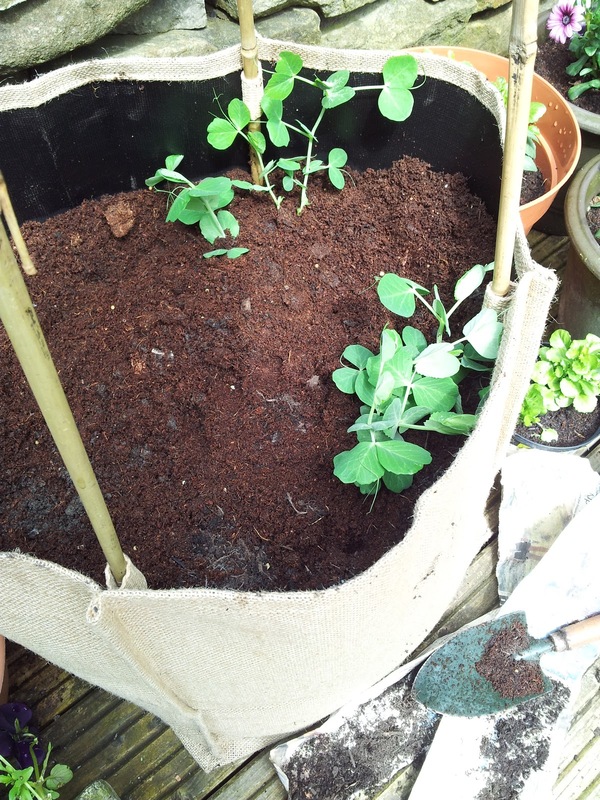 I've filled with a mixture of soil, multi-purpose compost and my Miracle-Gro enriched, expandable compost (see the review here) to ensure a balanced and nourished soil for the peas, since they will be growing in this same soil all summer. The canes have been fastened at the top and provide some support for the pea plants as they grow – they'll soon latch on and make their way to the top. So there we have it: easy peasy! If you have a balcony, patio, or tiny outdoor area, you really can grow some peas following these instructions – it's that simple. 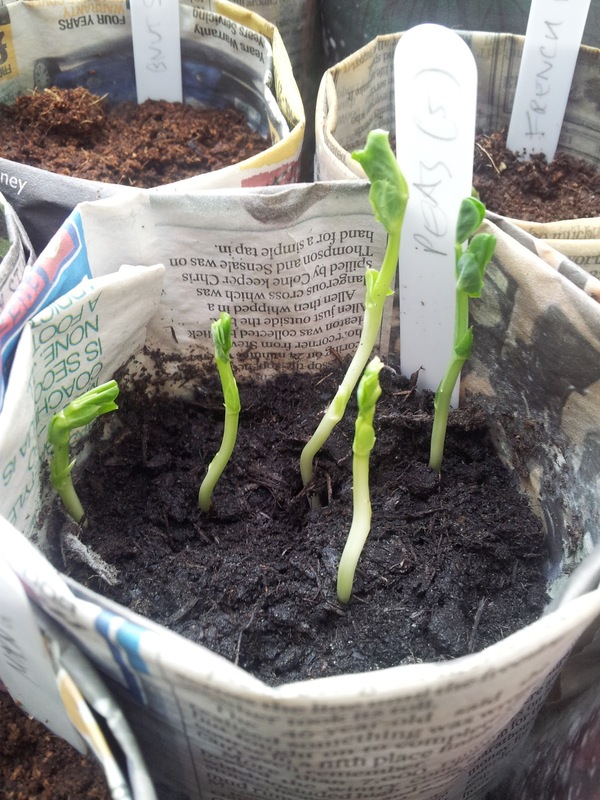 And due to the quick growth of pea plants, it's not too late to start growing your peas, from scratch, now! Good luck! 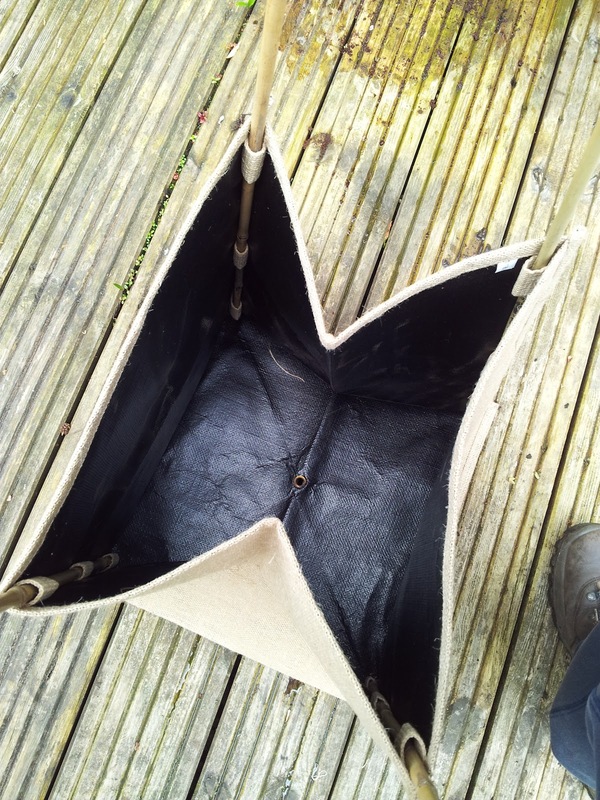 When I had an allotment, one of the things that really struck me was how much recycling, re-purposing and general 'make do and mend' was going on amongst my fellow allotment growers. 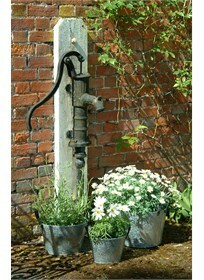 All gardeners have a knack for making use of ordinary objects to help them out in the garden and down the allotment. You may recall my blog post showing you how to make newspaper plant pots – a great way to create loads of environmentally-friendly flower pots at no cost, that can be planted directly into the ground and thus avoiding root disturbance. However, the savvy gardener really can make use of anything. 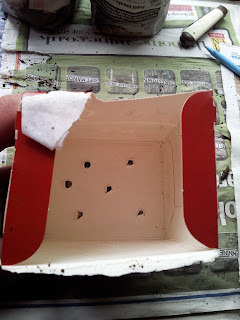 When starting another batch of pea seeds off, I needed a container but had run out of pots and newspaper. Undeterred, I looked in the recycling bin and found an old teabag box and set about re-purposing it. Here's how I did it. First, take the lid off, since this is not needed. Ensure that you pierce a few holes in the bottom, using an old pencil to pierce the box a few times. This ensures some drainage. Fill with compost, plant your seeds and Bob's your uncle! As you can see, this makes an effective pot that is as good as any flowerpot. Why not have a go yourself? 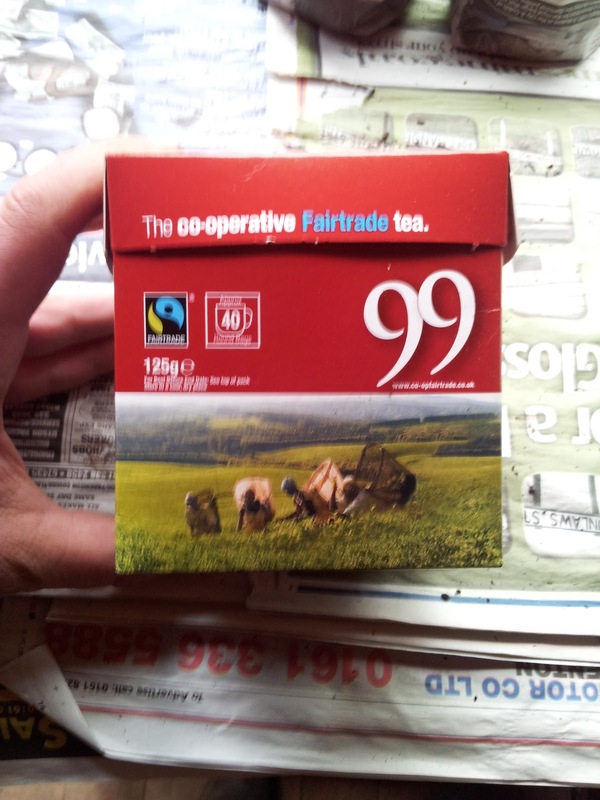 So, what have you thrifty lot managed to re-purpose? I'd really love to see what odds and ends are helping you out with your vegetable growing and gardening. Please tweet me your photos to @londonveggarden or come and post your photos on our Facebook page wall! Thanks! 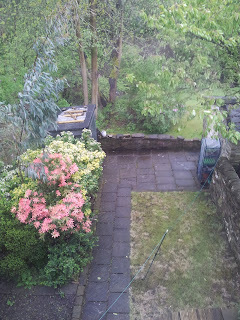 Yesterday morning, I rather hastily rattled off a blog post bemoaning the English weather (especially the Peak District weather) and the fact that my planned weekend of planting out was waylaid by damp weather. 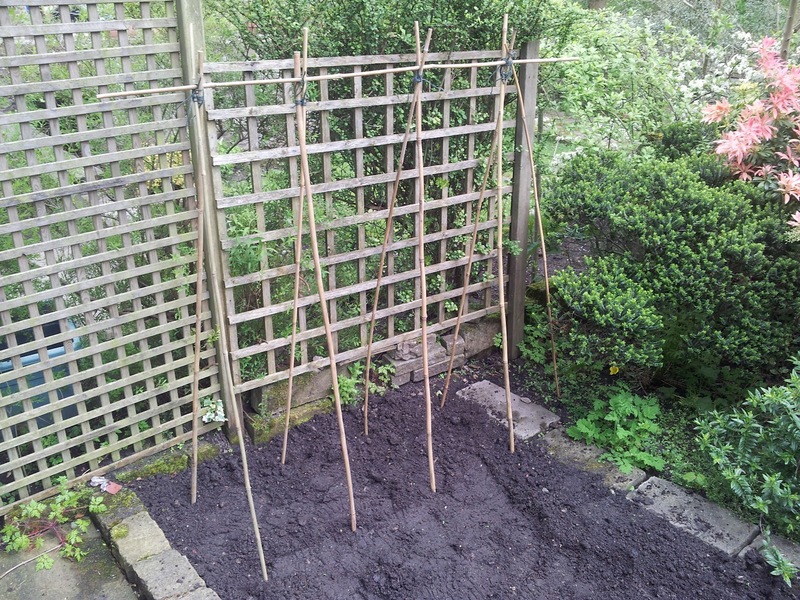 However, in typically British style, the weather perked up and I was able to get into the garden and start planting out the very first vegetables of the London Vegetable Garden this year! 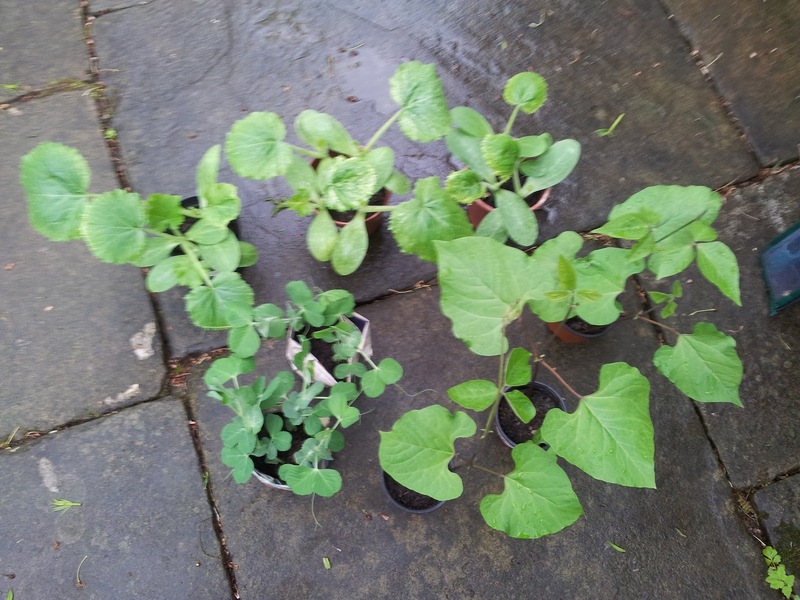 I had been especially keen to get this job done this weekend, since we are supposed to have some very warm weather this week – surely a perfect time to get vegetable plants outside and settled down into the outdoor climes. 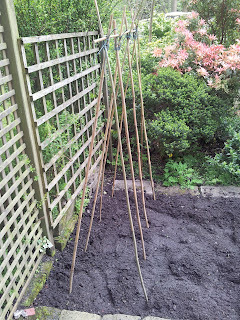 With the ground prepared, I then proceeded to set up my cane supports for the runner beans. 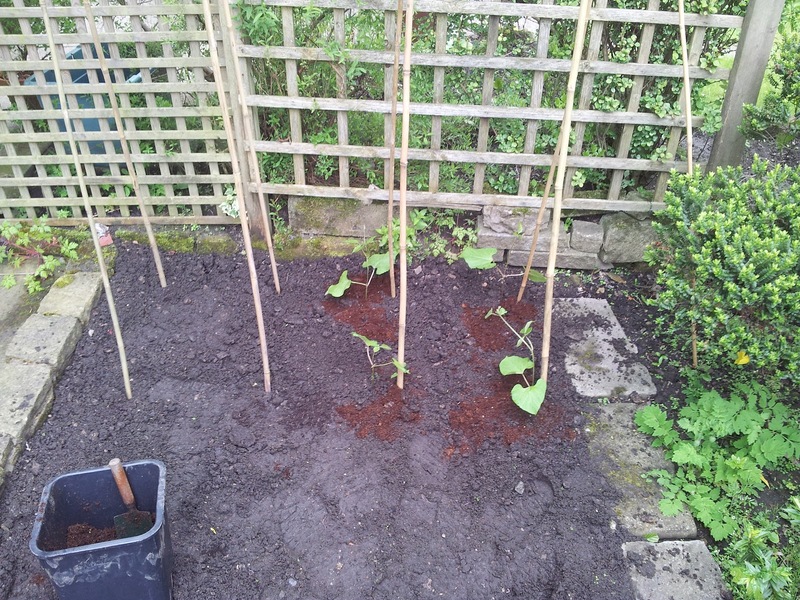 Initially, I had planned to place the runner beans along the right-hand-side of the plot; but realised that this would block a lot of the sunlight to the left of the vegetable patch. And this position does not get a great deal of sunlight as it is. 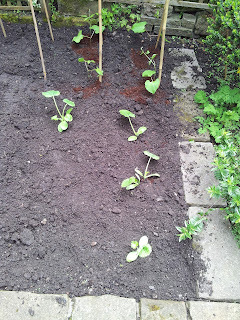 As noted in previous blog posts, I have conducted staggered seed planting this year, so the purpose of the day was to get a couple of the early vegetable plants planted out and then to see how they fare. If all is a disaster due to weather or pests, I have a reserve army of runner bean plants ready and waiting! 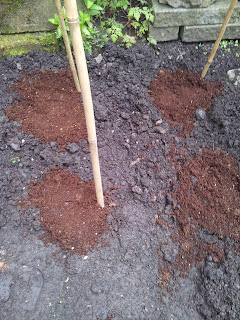 I dug a good hole around each cane support and mixed in some of my Miracle-Gro enriched compost. This compost has a lot of nutrients and plant food contained within it and considering the stony, dry nature of the soil I was planting into, I wanted to give my runner beans a bit of nourishment as I planted them out – hopefully this will help them to settle into their new surroundings. 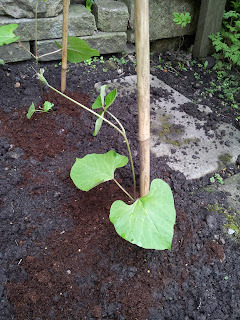 Following this, I also planted out a few of my courgette plants. 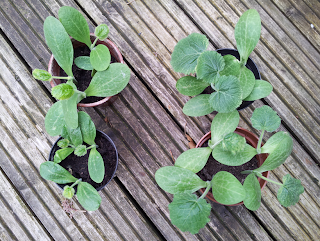 My early courgette plants have really started growing at quite a speed this week, helped in no small part by the warm temperature of the mini greenhouse. Their size meant that it was now time to get them into the ground and onto the next stage of their lives. 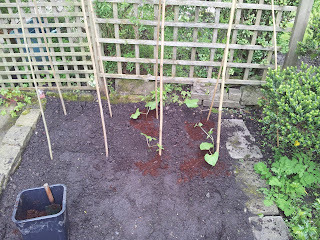 I feel that I could have planted the courgette plants a little more spaced out, but space is a premium and the plants are still relatively small. We'll see how they get on growing over the next few weeks. Needless to say, if all of them flourish and they actually do need more space, then we can simply sacrifice one of the plants to accommodate that. 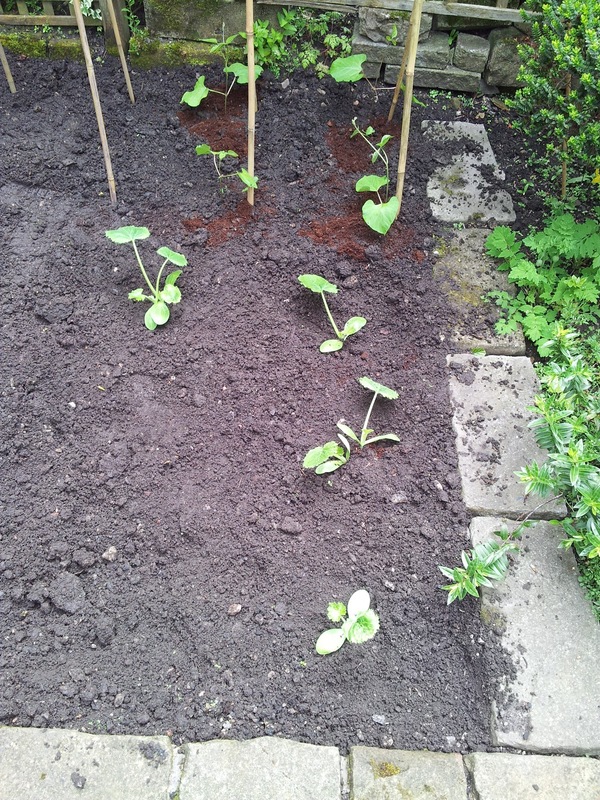 So there we have it – the first veritable 'plants' of this year's London Vegetable Garden project! It's always a worrying time for the gardener: will the plants take in their new soil? How many problems will birds and slugs cause me? 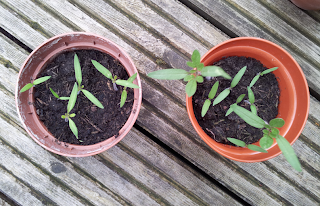 Will excessive rain or a sudden heatwave damage the plants? Who knows. But for now, we are out of the house and into the garden. 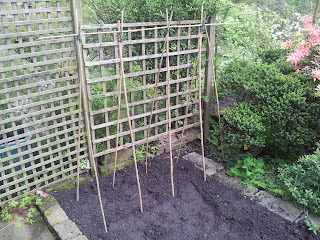 I also planted some peas this weekend, using a sack, some canes and only 2 feet of patio space. 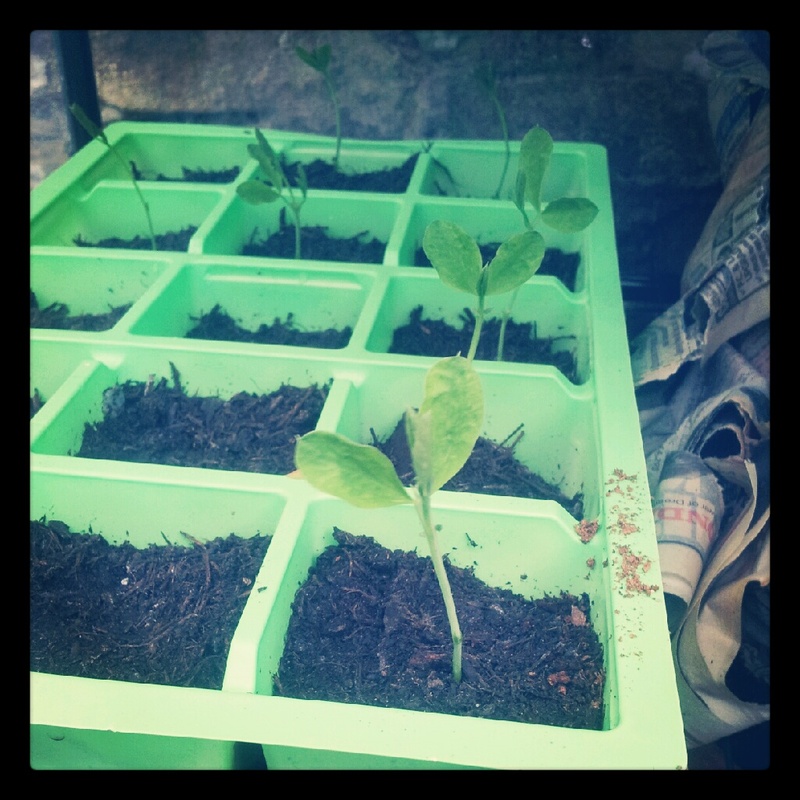 Next week I'll be showing you all how you can grow peas on a tiny balcony or on your city patio. Remember to bookmark the London Vegetable Garden, or get alerted to brand new articles by following me on Twitter @londonveggarden or by liking us on Facebook. This weekly round-up is normally titled 'seedling spotlight'; however it's change to 'plant progress' is extremely telling in itself. We're 5 weeks into this year's London Vegetable Garden project and even at this early stage, we're starting to deal with some substantial plants. 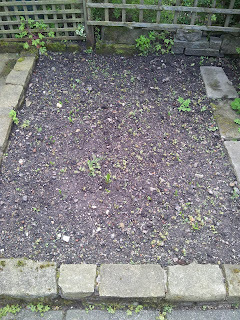 These plants were planted 5 weeks ago, however I have conducted some staggered planting this year, with a second batch of vegetable seeds being sown 12 days ago on the 7th of May. The early runner beans have really established themselves now. They are ready for planting out into the garden and worked alongside canes, which will be done this weekend, weather permitting! 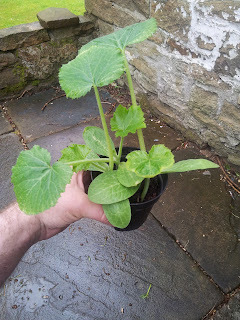 Courgettes are another plant that is really starting to flourish. 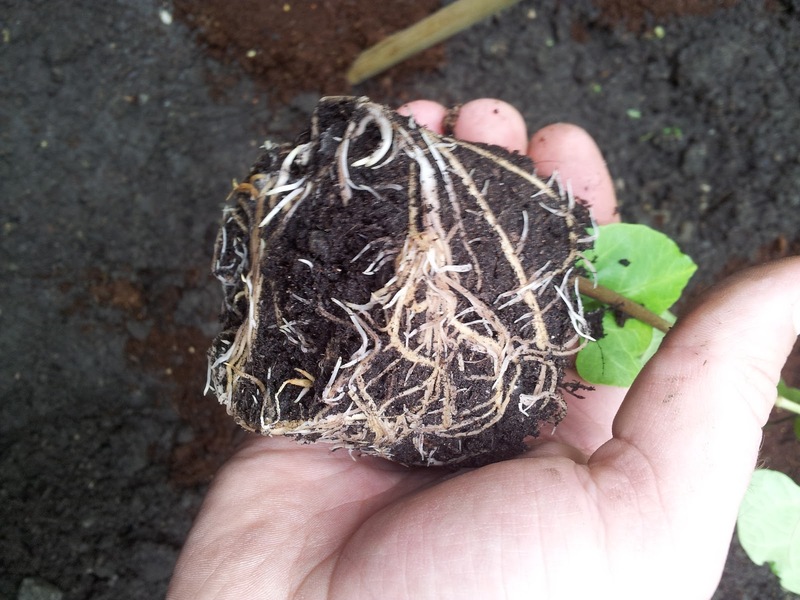 These plants grow quickly and they need planting out in the ground now, in order for their roots to spread out and seek maximum nourishment from the soil to aid their growth. 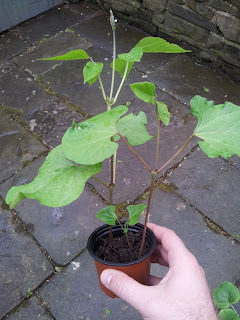 You can plant these in pots too, providing you give them a hefty size and some really enriched soil. There's nothing nicer than the taste of freshly shelled peas, which is why I'm so looking forward to these little chaps! Due to space restrictions in the garden, I'm planning to plant these in a hessian sack (available from all good garden stores) with cane support slots built in. 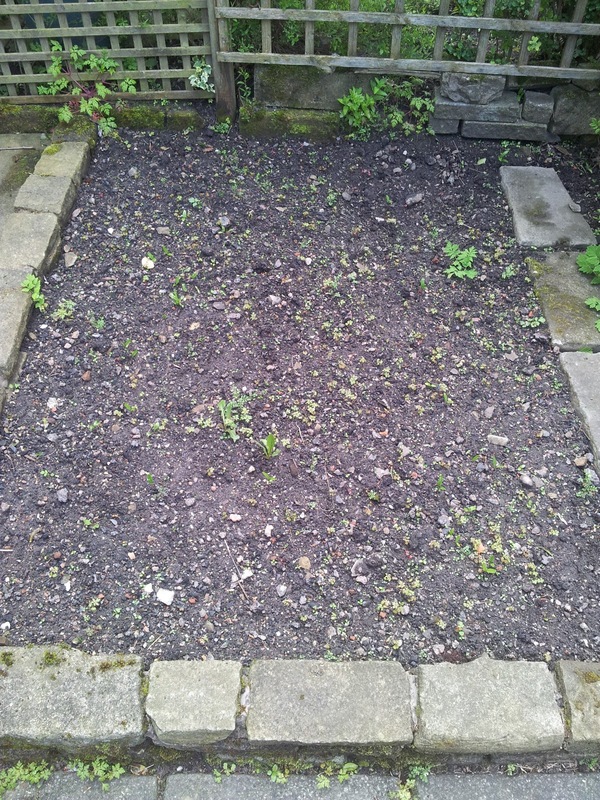 I have also planted peas in my second batch of vegetable plants too, so that I can stagger the crop throughout the summer, shown below. 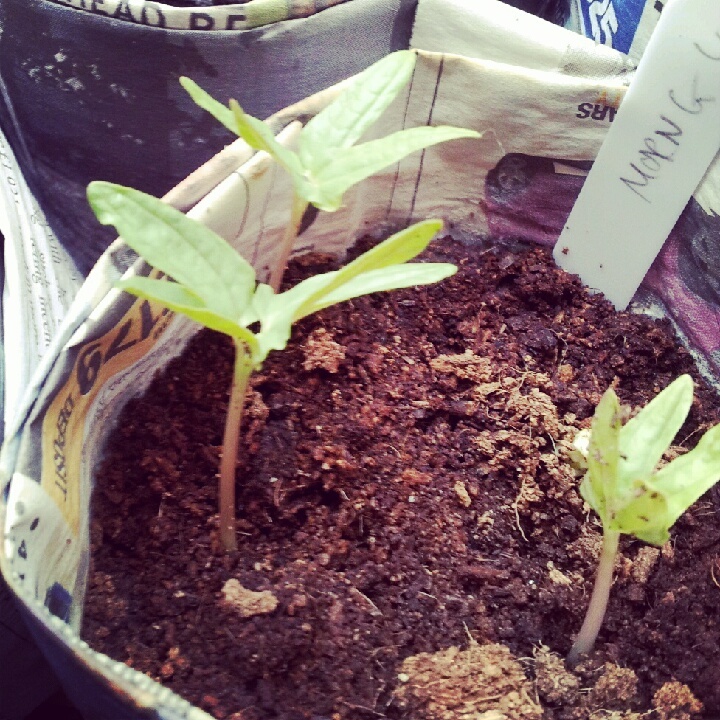 My tomatoes are also coming along nicely. Some thinning out is required and then in a few weeks, these plants will be a bit bigger and ready for direct planting into a grow bag. Radishes are very quick and easy to grow and provide a fantastic, crunchy kick to summer salads. 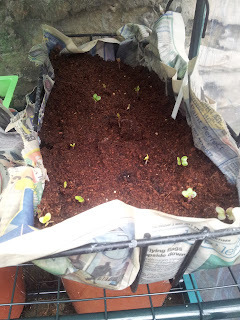 I planted some radish seeds 12 days ago, making use of an old wire frame for hanging flower boxes from balconies. 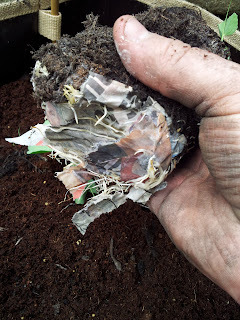 I lined it with plastic bags (with drainage holes) and then newspaper, before filling with compost. 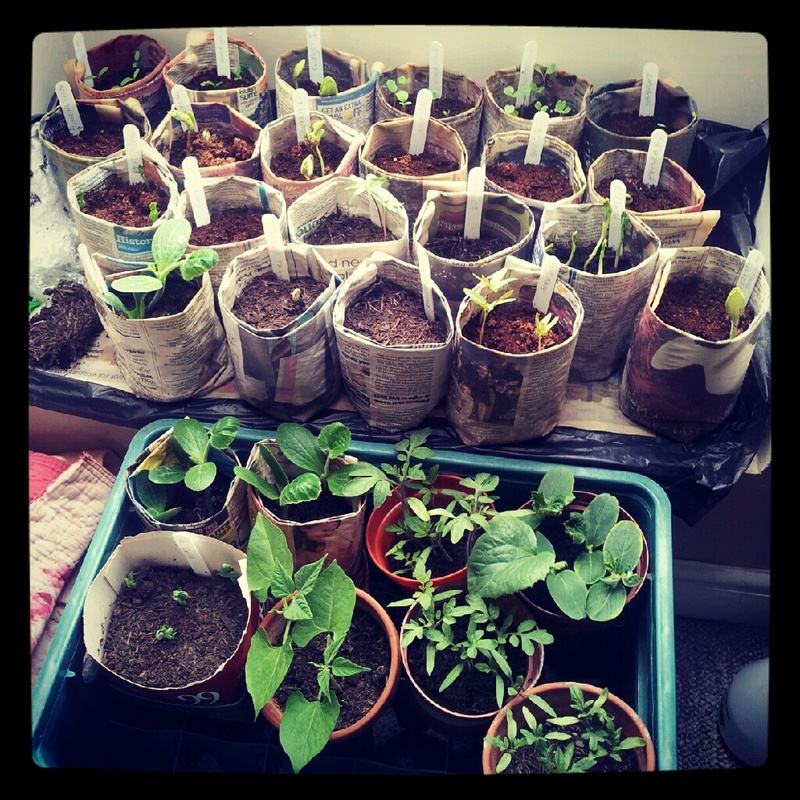 Very makeshift, but it doesn't matter - plants don't mind where they grow! 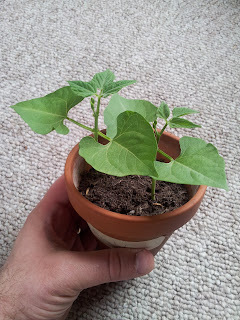 This is the first year I've attempted French beans and they seem to be slower than other vegetable plants, yet coming along fine. 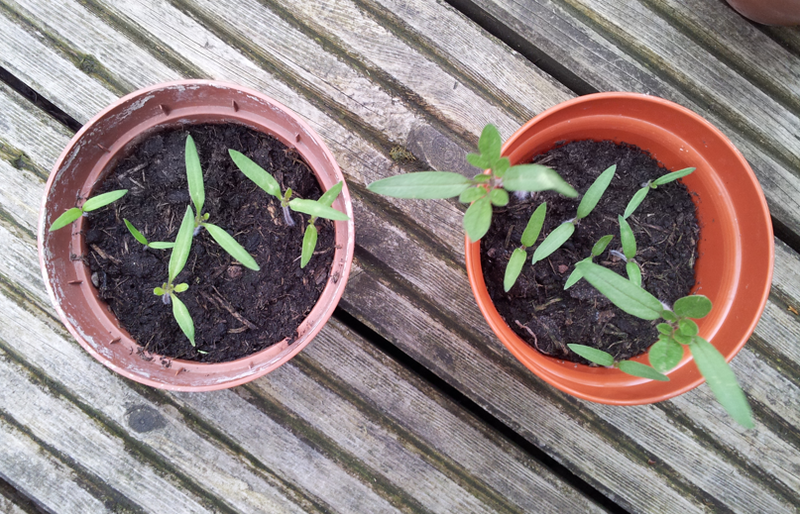 Below you can see a '5-weeker' and a '2-weeker', representing the plants I have grown at different times. Once again, I passionately believe that as vegetable gardeners, we learn from each other. This blog chronicles my attempts at growing vegetables, but I'm just as interested to hear from all of you. Please feel free to share your own gardening stories by leaving a comment on the blog, on our community-driven Facebook page or even on Twitter. Good morning dear readers and welcome to a rather damp, windy and dull London Vegetable Garden. Today had been set aside for that seminal event in a gardener's yearly cycle – planting out! For many of us, this occasion feels very much like sending children off to university: they're big enough to hold their own and they have to make their own way in life, but we're still worried! As I sit and write these thoughts, coffee in hand, the time is 8:51 in the morning. So we have a lot of time left in the day (and indeed the weekend) for the sun to come out, dry the garden up a bit and for me to get weeding! Incidentally, I am planning an upcoming blog post on planning your vegetable gardening. 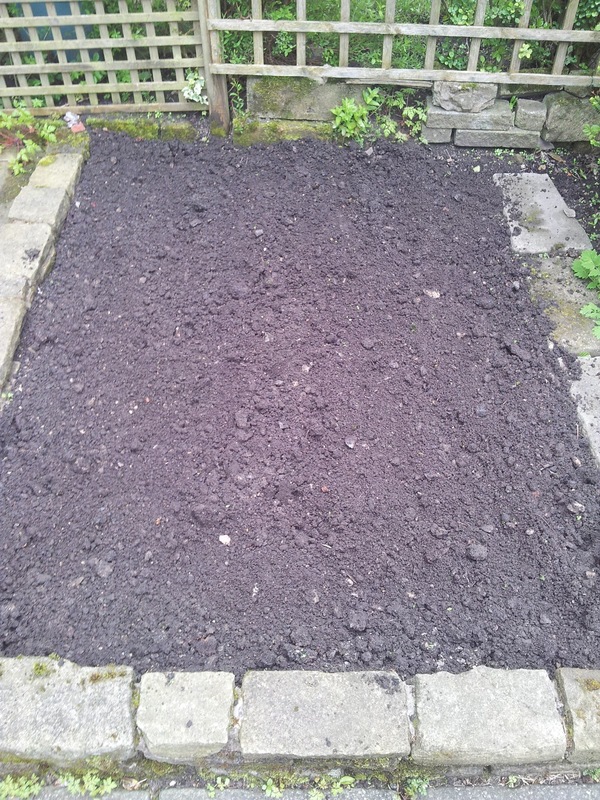 Despite having a lovely little garden in which to potter, the actual 'soil space' I have to grow vegetables directly into the ground is only approximately 5' by 4'. So, I have made a drawing plan of the garden and am going to show clever ways around lack of soil space – there should be some great tips for all you urban gardeners out there. Watch this space! Walking to work this morning, I genuinely considered donning some gloves. There was a veritable chill in the air, the North Face winter jacket was zipped up to my eyeballs and the wind howled around me as I paced Manchester's busy streets. This is a post about that age old rogue, the BRITISH WEATHER. There's no doubt that this spring the weather has been unseasonably bad – showers, cold temperature: we even had hail yesterday morning. But while I can seek refuge in sensible clothing and a (thankfully) overheated office, what about the London Vegetable Garden plants? 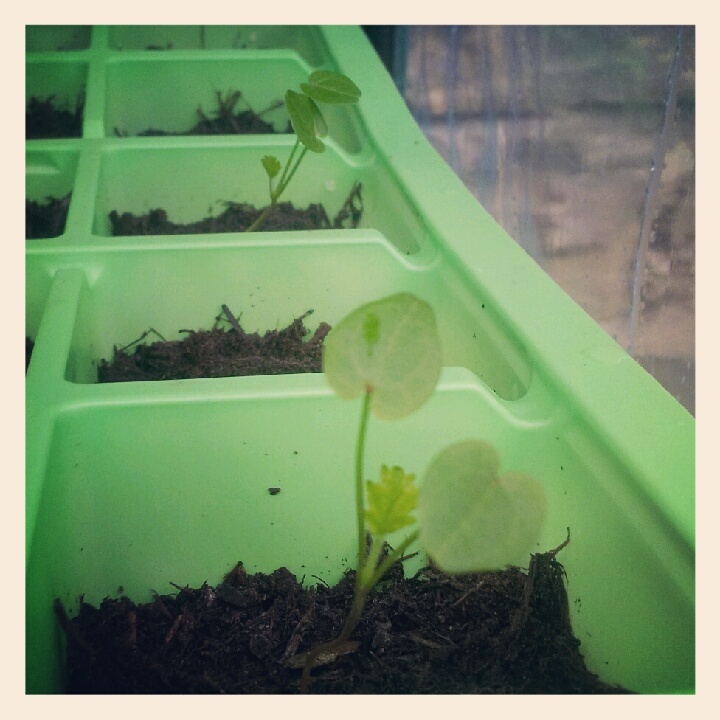 I'm currently growing several vegetable seedlings, as well as staggering the growing of further seeds. Despite living in a roomy cottage, space remains at a premium, so while some plants have been enjoying a skylight in my wife's attic studio, I have been hardening others off outside during the day before moving them into the outside mini greenhouse. Despite this outdoor protection, temperatures have been regularly reaching zero recently, which makes me glad that I haven't planted anything out just yet. 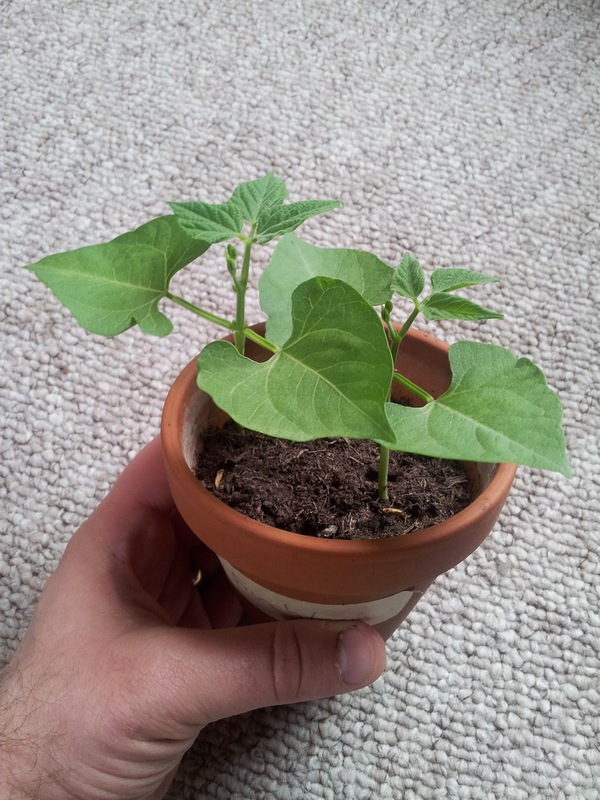 In the spirit of this blog, I decided to compare my indoors and outdoors plants to see whether being outdoors really has affected the young vegetable plants in any way. As you can see, the plants on the right (indoors) are faring better than the outdoors plants. 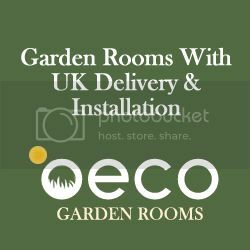 The outdoors plants are by no means suffering from the adverse weather; yet they are equally taking a bit longer to grow than their indoor counterparts. So what does this mean for growing vegetables outdoors, be it in pots on the balcony, in grow bags on the patio, or indeed, out in the vegetable garden? Well, from my amateur observations, it appears that this cold weather IS affecting plant growth – but not to the extent that it will actively damage the plants – especially if they have been hardened off. * Harden off plants by placing them outside during the day and bringing them in during the night. 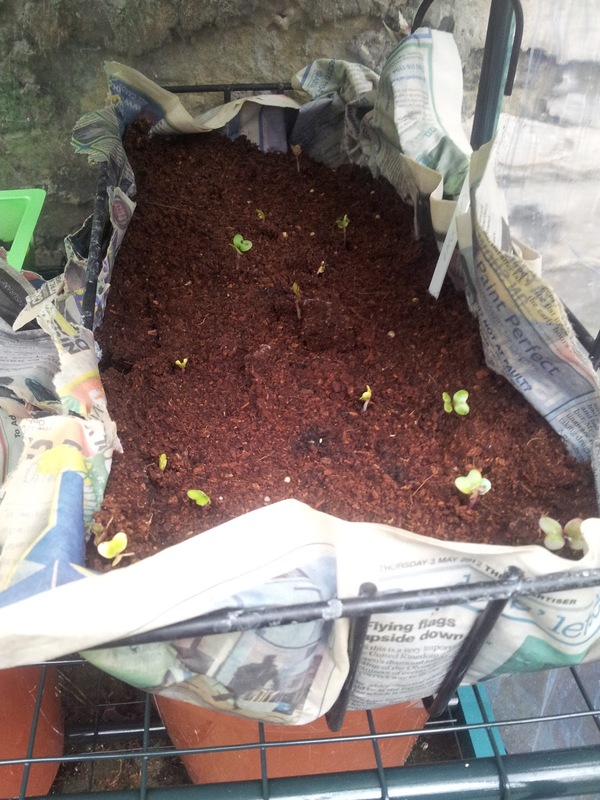 This gives them a chance to acclimatise to their new outdoor climate while ensuring that the young seedlings and plants aren't killed off by a sudden frost before they are hardy enough to hold their own. * Keep warmth-loving plants like tomatoes, cucumbers and courgettes inside on a warm windowsill until they are really established young plants. This ensures that they have built up some sturdy strength for when you do plant them. * Finally, don't panic! If the cold weather has meant your vegetable plants are growing slowly; fear not! We're all in the same boat and it simply means we'll have our vegetable crops a few weeks later than we would have. And who knows – we may have a long summer to keep vegetable plants cropping well into September! I'd really like to hear what YOU lot, my faithful readers, are experiencing with the weather. What are YOUR seedlings and plants doing? 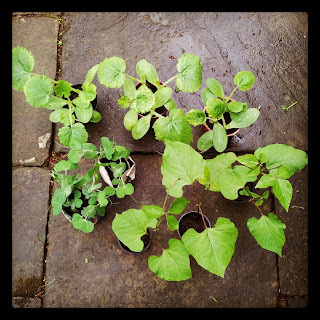 Do you have any tips to share with the London Vegetable Garden community? Please feel free to add your comments below, tweet me @londonveggarden or share your tips over on Facebook.